Following JPMorgan's across the board beat, and Wells Fargo's latest disappointing results, moments ago Goldman reported a mixed set of numbers, with the company solidly beating on earnings, as EPS came in at $5.71, above the $4.89 expected, while revenues disappointed, printing at $8.81BN, below the $8.99BN consensus exp., and down 13% from a year ago. Of note, Goldman reported an effective income tax rate for Q1 of 17.2%, up from the full year rate of 16.2% for 2018, as the tax cut tailwind is now officially over. The equity weakness was offset by stronger than expected FICC numbers, as revenue in the highest margin segment printed at $1.84BN, above the $1.78BN expected, but well below the $2.084BN from a year ago. 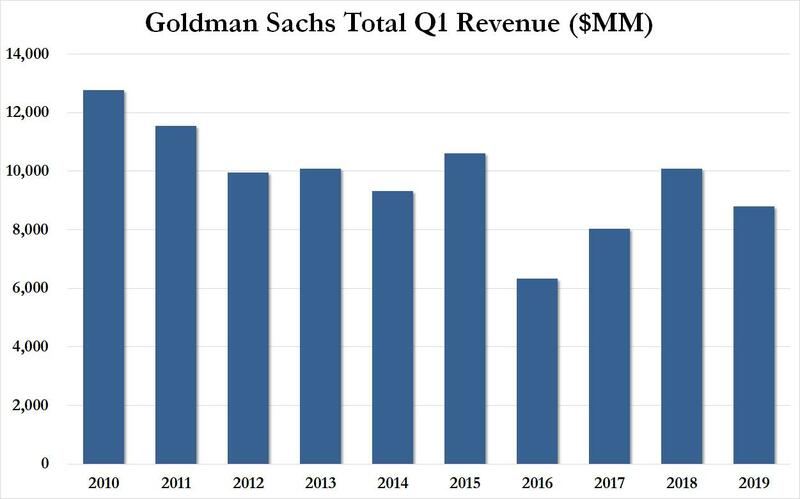 Commenting on the 11% drop Y/Y in FICC, Goldman said that this reflected "lower net revenues in interest rate products, currencies and credit products, partially offset by higher net revenues in mortgages and commodities." While trading disappointed on net, the biggest upside surprise came fromt he bank's investment banking segment, which were $1.81 billion for the first quarter of 2019, unchanged compared with the first quarter of 2018 and 11% lower than the fourth quarter of 2018. 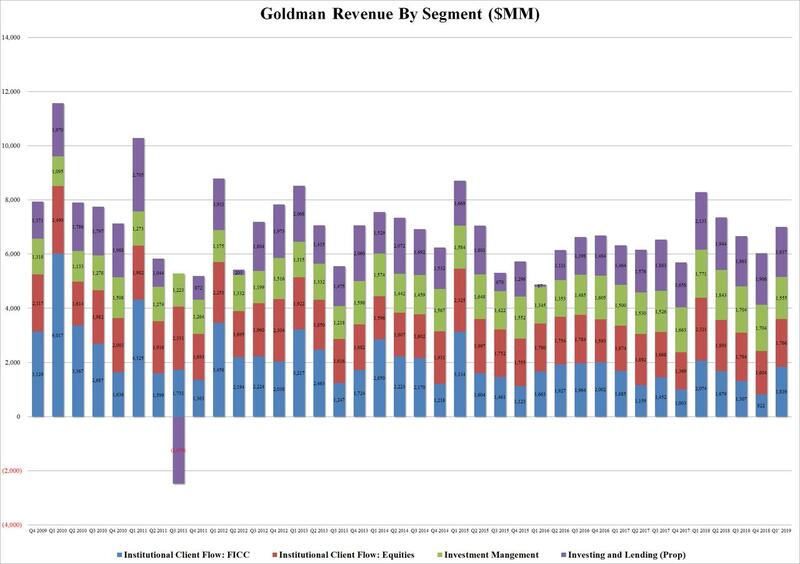 And even as net revenues in Underwriting was $923 million, notably, or 24%, lower than the first quarter of 2018, due to significantly lower net revenues in equity underwriting, "primarily reflecting a significant decline in industry-wide initial public offerings, and lower net revenues in debt underwriting, primarily due to significantly lower net revenues from leveraged finance transactions," the most impressive aspect of Goldman's business was Financial Advisory revenues, which jumped to $887 million, well above the $819 million expected, and 51% higher than the first quarter of 2018, "reflecting an increase in completed mergers and acquisitions volumes." In other words as trading has continued to shrink, it was all up to the bank's M&A bankers to salvage the quarter. 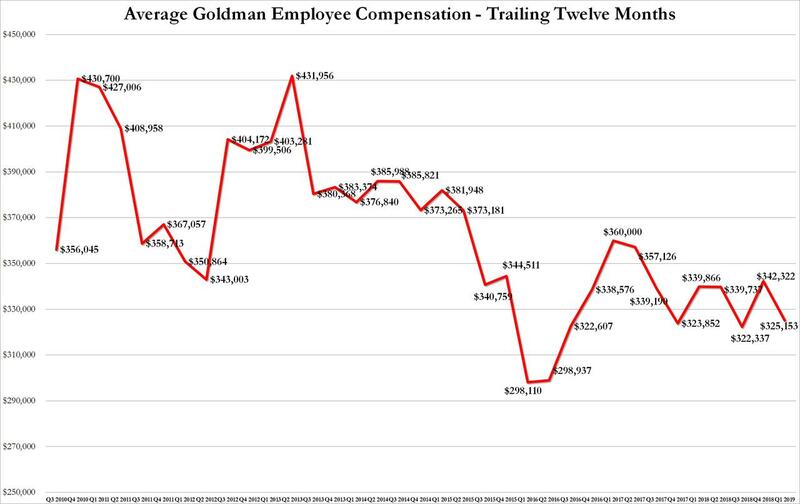 Reflecting the disappointing Q1 revenue, Goldman's Q1 compensation expenses shrank to $3.26 billion from $4.1 billion a year ago, below the estimated $3.61 billion, and with Goldman's headcount declining once more and shrinking to 35,900 from 36,600, this meant that average compensation per Goldman employee was fractionally lower, to $325,153 down from $342,322 a quarter ago, and has been stuck in a narrow range in the low $300,000s for the past two years. Commenting on the results, CEO and DJ David Solomon was upbeat as expected, saying that "we are pleased with our performance in the first quarter, especially in the context of a muted start to the year. Our core businesses generated solid results driven by our strong franchise positions. We are focused on new opportunities to grow and diversify our business mix and serve a broader range of clients globally. With improving momentum across our businesses, we are confident that Goldman Sachs will generate attractive returns for our shareholders." The market reaction to Goldman's earnings however was rather more muted, and reflected disappointment, as the stock initially spiked on the EPS beat and dividend boost, however it has since shrunk and was modestly in the red as traders digested the continuing weakness in the company's trading group. This entry was posted on Monday, April 15th, 2019 at 10:43 am and is filed under Immediately available to public. You can leave a response, or trackback from your own site.